Have you ever wondered if plant-based cleaning products are effective? You would be surprised to learn that often times, the products with the most natural ingredients are more effective than anything you’ll find on the grocery store shelves. Scroll down to learn about Young Living’s Thieves cleaning products and how they can help you kick the chemicals out of your house and trade up for a more natural, healthy approach to keeping your home clean! Thieves is an incredible essential oil blend of clove, cinnamon bark, rosemary, lemon and eucalyptus. It is known for neutralizing airborne bacteria, reducing stress, supporting our immune systems and it smells like a tiny bottle of autumn. It’s absolutely dreamy. Stop worrying about your kids eating off of a countertop you just wiped down using antibacterial wipes and switch over to Thieves which is more effective, all natural and more likely than not, more cost effective coming in at around $1 per spray bottle. The best part is that you can get started with your essential oil journey and with Young Living by grabbing a Thieves Starter Kit! 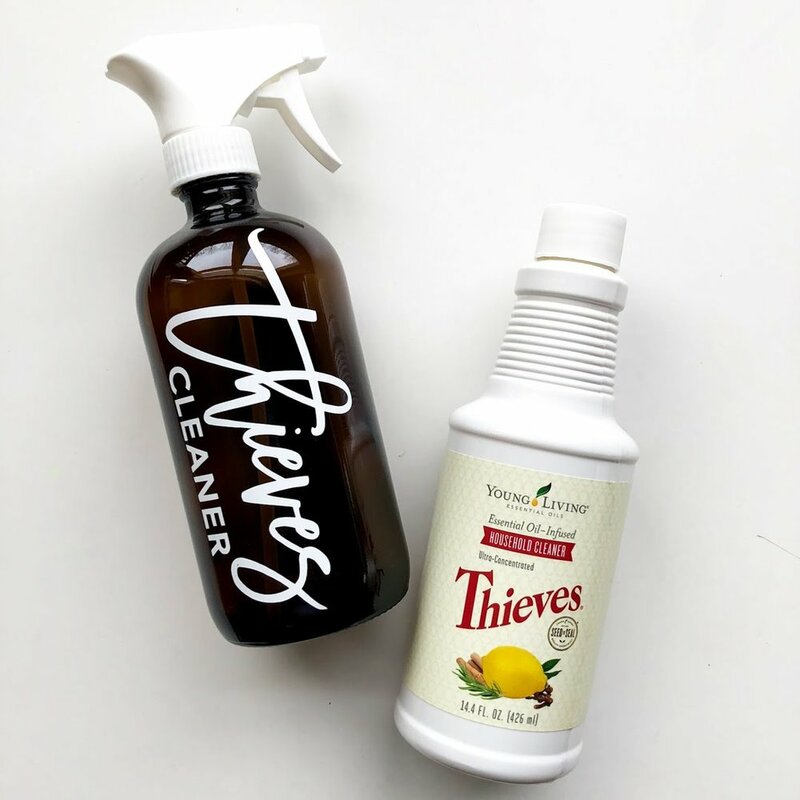 Filled with all the Thieves products you need to get started, you can ditch your old toxic cleaners and make a clean transition to a healthier option for you and your home! Young Living offers everything from Thieves Vitality Oil to Dish Soap, Household Cleaner, Hand Purifier and even mints. Stop covering your kitchen, windows, dishes and hands with crazy chemicals from who-knows-where and start using cleaning products infused with 100% pure therapeutic grade essential oils.